WARNING: Massive spoilers ahead unless you've read up to this point! You know the deal! Go read the rest of the series first and come back for more! 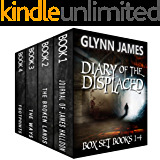 Books 1 & 2 on sale for release! With Gilly and Becky now saved from the Labyrinth, Reece turns his attention to the original mission of saving Citadel. But in order to discover it, they’ll need to leave the fantasy realm of Nasgar and cross the wild to explore a harsh and futuristic dystopia in hopes of accessing the archives that may lead them to their home. But as they face powerful enemies, a blood-thirsty AI and challenges like never before, a dark secret from Rembrandt’s past threatens to bring it all undone. Join Reece as he uncovers more mysteries within the Crystal Shards and confronts the strange new enemy that threatens both it and his home. In order to defeat them, he’ll need to unlock even more powers within the gameworld and grow into the man and leader that his team needs him to become. BUY BOOK 4 OF CRYSTAL SHARDS ONLINE TODAY! Capturing the reader in as immersive a read as any I've experienced before, this stage of the shard warriors saga is poignant, human and fierce. Spinning dervishes of action interplay with tactical politics that made my mind tumble. It'll be hard to top this. I loved it and expect I'll be rereading it again in the future. This book is a solid 4 and a half stars which I've bumped up to five as Amazon doesn't do half stars. This book is back up to par with the others after the slight dip in the last book. 5.0 out of 5 starsNot just a fantasy story. A genre for everyone. A interesting and fun genre shift from the other books that was fun to read. It feels like the author has taken a lot of time to fully flesh out this world so that everything makes sense. As far as the characters are concerned the interactions between the group contine to be one of this author's strongest points. I continue to be eager to watch how everyone develops and grows and enjoy the fact that everyone is well rounded and that nobody is perfect. I look forward to seeing how the burgeoning relationships develop further and if tensions cause problems or if everyone ends up in their happy relationship with their chosen partner(s). Now excuse me while I read everything again and impatiently wait for book 5. 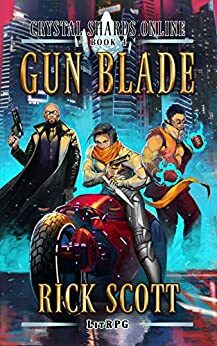 5.0 out of 5 starsloved it well written Litrpg! So we are book 4 into crystal shards online which if you read book 3 raised the stakes even more. We get more questions then answers but the book has a way of grabbing you for you to desire to know more. I normally get burned out by this time but crystal shards online still feels fresh for me. 5/5 especially due to mc character growth! The last review I wrote focused on the great characters, and they're still a huge draw for me, but what struck me with this book 4 is the scope of the narrative. It's expanding, it's coherent, and it does an excellent job ramping the stakes. Character development continues and we learn more about some of the people surrounding our MC. Again I have to say it, this is an amazing coming of age story, a great adventure, and I'm proud to have the book on my digital shelf. First book was a breath of fresh air (not for the Citadel i guess). Second book kept me entertained. Third book kept me happy yet again. Fourth book was a direct preorder. Characters are well developed, they stay true to their beliefs and main character (MC) does not make silly mistakes (mistakes are okay, just not the silly ones), leap of faiths and other utter nonsense stuff. Starts off very slowly (slow is good) and builds into much much bigger world. One of the most important things for me is not changing the point of view (POV) while telling the story. I like to follow MC all the way without those disruptions - while I understand the necessity in some books I utterly loathe it. That being written, the POV actually changes - but - only between 2 characters and the change is consistent in every book and the chapters are short and non-intrusive, something like "hey, while you are doing this and that.. this happened, just FYI". Every book is set in an unique (uniqueish) enviroment and the fights are mostly unique as well. Can't really write anything more meaningful without spoiling it all. Go read it. It's great. A setting shift to cyberpunk that fleshes out Rembrandt and further builds on the revelations from the labyrinth. Solid writing and interesting storyline. Also, in a surprise Shinning move (“Don’t you mean the Shining? Shhh! Ya wanna get us sued? !”), includes a blatant Bankai ripoff for anime fans.